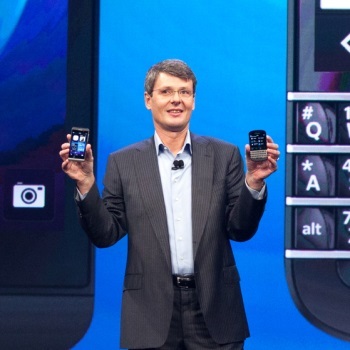 BlackBerry reports losses of almost $1 billion in the second quarter of 2013. Trading of BlackBerry shares were temporarily paused today when the company revealed their preliminary results for the second quarter of the 2013 fiscal year. BlackBerry announced in a press release that it expects net operating losses of approximately $950 million to $995 million. The company also detailed changes in its business strategy and drastic restructuring plans with the aim to reduce operating costs by 50% by the first quarter of 2015. The restructuring will mean the loss of approximately 4,500 positions, cutting BlackBerry's workforce by almost 40% to about 7,000 employees. BlackBerry's press released stated its focus moving forward would be on its "enterprise and prosumer market" - that is, business users. BlackBerry will reduce the number of smartphones it offers from six to four, just two high-end and two entry-level phones. The underwhelming sales of the BlackBerry Z10, the first BlackBerry phone to feature a touch screen, contributed to the company's poor performance in the second quarter. BlackBerry confirmed that the Z10 would be one of the two entry-level phones on its four-device roster. BlackBerry announced in May 2012 that it would be conducting a strategic review, and that it had hired the Royal Bank of Canada and J.P. Morgan to assist. The company has struggled to compete in recent years against smartphone platforms from Apple and Google. Though the total number of smartphone users has increased significantly since 2010, when 40% of users had a BlackBerry, the proportion of BlackBerry users out of all smartphone users had plummeted to only 6% in January 2013. Update: BlackBerry has announced a provisional agreement for the sale of the company to Fairfax Financial Holdings in a deal worth $4.7 billion. Fairfax Financial Holdings is a financial holding company whose CEO previously sat on the BlackBerry board. The sale, which is subject to regulatory approvals, would make BlackBerry a private company.